Foot Levelers Pillo-Pedic Ultra Neck Pillow from HealthyKin.com has memory foam for an Adaptable Therapeutic Edge of UltraCel foam which continuously conforms to the head and neck for gentle, corrective support. It virtually eliminates break-in time and increases comfort. 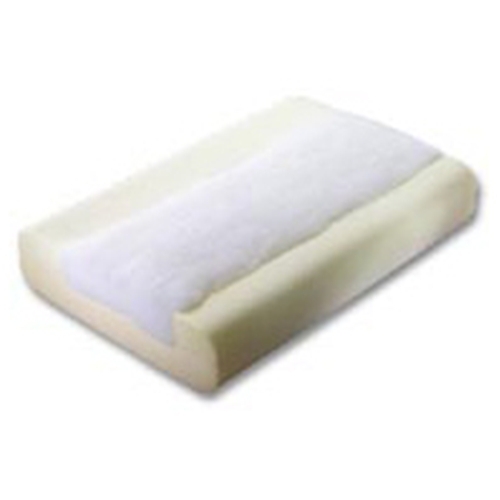 The same foam base as the standard Pillo-Pedic Pillow, but the neck portions are memory foam. This pillow is just what my neck needs. I've used this brand/type of pillow for years and it has saved me so much money at the chiropractor and keeps me almost pain free. It is just a shame it's so much money. I have used this brand of pillow for years. I wouldn't have anything else. Great for chiropractic care of your neck!! Great pillow I had used the smaller orginal pillow before . However my neck says thank you. Just took a few days to get used to a new pillow. Not as hot as those new foam pillows cools off just right.